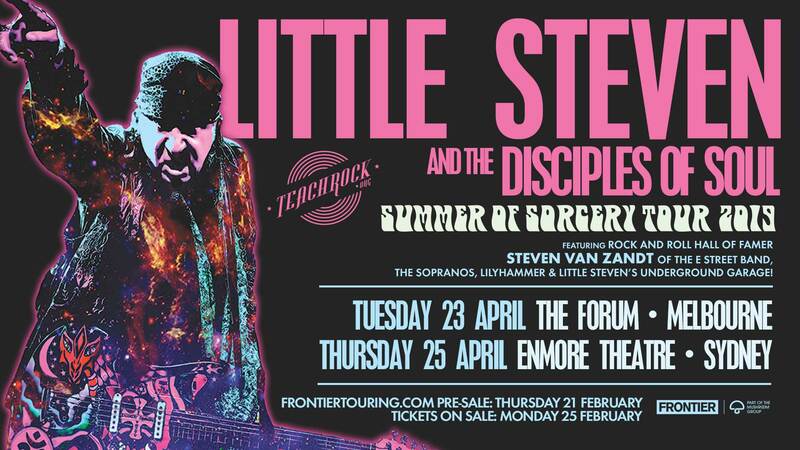 Musician, songwriter, producer, actor, director, activist, radio DJ, Rock and Roll Hall of Famer, and one of the founding members of Bruce Springsteen’s iconic E Street Band:Steven Van Zandt brings his infectious, rousing Rock & Soul band Little Steven and the Disciples Of Soul to Australia for two life-affirming headline live shows in April 2019, proudly presented by Frontier Touring. Little Steven and band will perform two exclusive headline dates: Melbourne’s Forum Theatre on Tuesday 23 April, and Sydney’s Enmore Theatre on Thursday 25 April. 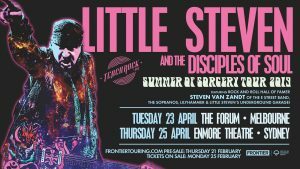 Tickets go on sale Monday 25 February (1pm AEDT) via frontiertouring.com/littlesteven. After creating the “Jersey Shore” sound with the Asbury Jukes, Little Steven became a founding member of Bruce Springsteen’s E Street Band, as well as co-producing two of Springsteen’s most beloved albums, Born In The U.S.A and The River. He went on to become a successful solo artist in his own right, recording and performing with his band Little Steven and the Disciples of Soul. In 2017 he released his first new album in over 15 years, entitled Soulfire, returning to his Rhythm and Blues roots, withRolling Stone USA declaring it one of their “Best Albums of 2017”. Check out the tour’s companion live album, Soulfire LIVE!. As a songwriter, Van Zandt’s songs have been performed by the likes of Jackson Browne, Pearl Jam, Jimmy Cliff, Damian Marley, Margo Price, Nancy Sinatra, Brian Setzer and many more. He also co-wrote Jimmy Barnes’ iconic 1985 track ‘Ride The Night Away’, which appeared on the smash hit album Working Class Man. Radio lovers also know him as the artist behind “Underground Garage” (‘Mind-blowingly great… the most exciting thing to happen to rock radio in years” – Rolling Stone), his internationally syndicated show launched in 2001 and the USA’s most successful syndicated Rock radio show in the past 40 years. Then there’s Wicked Cool Records, the record label Van Zandt started to further support new Rock and Roll bands. As an actor Van Zandt made his acting debut in the legendary, award-winning TV Mafia-drama “The Sopranos” playing ‘Silvio Dante’ (a role he created). He would go on to star in, co-write, executive produce, provide the music supervision, score, and direct (the final episode) of “Lilyhammer”, which was the FIRST original programming for Netflix. Skip to 2019, and just last month Van Zandt was out on the picket line in Los Angeles with striking teachers, after recently launching TeachRock, an education program which uses the history of music as a way to engage students, providing resources available to educators at NO COST. Ten years in the making and with a board including Van Zandt, Springsteen, Jackson Browne, Martin Scorsese and Bono, it’s been a smashing success. Last year Little Steven and the Disciples of Tour went back on the road with their landmark live “Soulfire Teacher Solidarity Tour.” It marked the first-ever Rock tour specifically geared towards addressing the crucial societal need of helping educators and saw over 18,000 teachers (and counting) register to use the TeachRock Music History Curriculum. At each stop of the tour, The Rock and Roll Forever Foundation hosted FREE TeachRock Professional Development Workshops, with educators and a guest who attended also received a FREE ticket to that evening’s concert. A limited number of tickets have also been put aside for educators to attend the Melbourne and Sydney shows for FREE. Visit TeachRock.org to sign up and for more info. Live on stage, Little Steven and the Disciples Of Soul are a true force to be reckoned with! This will be a night of MAXIMUM ROCK AND SOUL like no other – grab your tickets immediately, don’t miss out!